Heartfelt and humorous stories about work, family, loss, and love bring god into everyday life in this unique and quirky devotional. You don't have to pray for hours a day -- all God asks is that you keep the holy spirit in your heart. In three hundred words (or less), Peter B. Panagore can help you build a strong relationship with God, while reminding you of what is truly important in life. 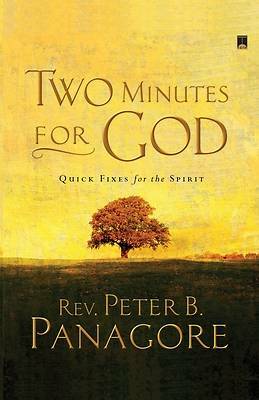 From childhood pet ducks to fixing a house foundation, "Two Minutes for God "features anecdotes from Reverend Panagore's own life as well as those of the people and world around him to illustrate how pieces of the sacred live within everyday events. Encompassing many cultures and a wide variety of religions, Panagore does not exclude anyone from his perspectives on spirituality, prayer, and God's relationship to the world around us. Covering contemporary but timeless topics such as love, loss, healing, work, bullying, mythology, celebration, and family, "Two Minutes for God" provides a daily infusion of faith that will last all year long.